MISHAWAKA – Kyle Hatch claimed his third championship Friday in the prestigious Al Smith Invitational the old-fashioned way. The Warsaw star wrestler earned it. Hatch beat a pair of previously undefeated grapplers on the final day of the 32-team event to claim to the top of the podium for the third straight year. Senior Hatch ran his season mark to a perfect 28-0 with impressive wins over Logan Coyle of Center Grove in the semifinals and Kenny Kerrn of Jimtown in the title match to take home bragging rights in the 152-pound class. Hatch beat Coyle by a pin in the semifinals and then topped Kerrn by a 6-4 decision in the finale. Kerry was the No. 3 ranked wrestler in his class. 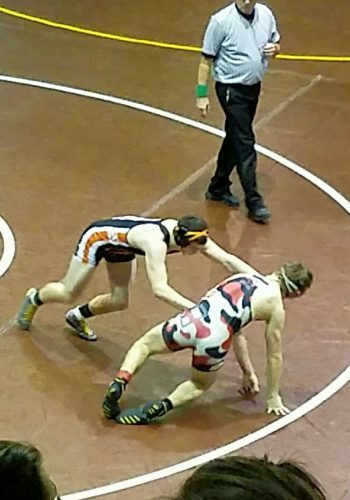 Hatch, who went 5-0 in the loaded two-day event at Mishawaka High School, has placed at the State Finals twice in his illustrious prep career for the Tigers. A pair of Jimtown wrestlers earned titles for the Jimmies, who finished in a tie for seventh place in the final team standings. Sophomore Hunter Watts of Jimtown claimed a title at 113 and classmate Conner Grimson earned a championship at 132. Watts is now 20-1 on the season and Grimson improves to 21-0. Portage totaled 220.5 points to claim the team championship among the 32 squads in the field. Warsaw returns to action at Goshen on Jan. 12. Kyle Hatch continued his unbeaten senior season in impressive fashion Friday.